Hecht 947 with primer. 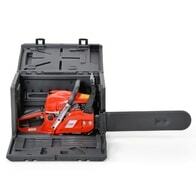 Power output 2,7 HP. Bar length 39 cm. Weight 5,4 kg. Carburetor WALBRO. OREGON chain and chain bar. Petrol chainsaw Hecht 951 with primer. Power 3 HP. Rail length 39 cm. Weight 5.4 kg. Decompression valve, WALBRO carburetor, Oregon bar and chain. 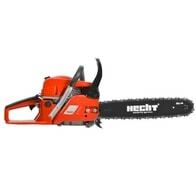 Petrol chain saw HECHT 957 with primer. Power output 3,5 HP. Bar length 39 cm. Weight 5,4 kg. Carburetor WALBRO. OREGON chain / chain bar. 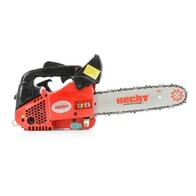 Petrol chainsaw with displacement of 62 cm³. The power output 4HP, a chain bar OREGON with lenght of 45 cm, weight – 6,3 kg, carburettor WALBRO. 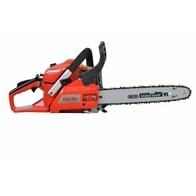 Petrol powered pruning saw with telescopic handle (+- 130 cm).